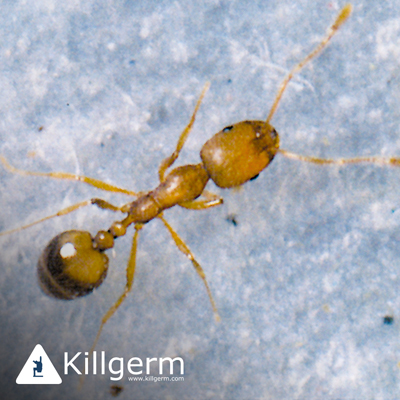 Pharaoh's Ant probably came from North Africa, but is now widely found throughout the British Isles. They are often found in hospitals and prisons, but are increasingly being found in domestic properties and blocks of flats. They are generally not found outdoors. The ant may carry diseases and can contaminate food and sterile dressings due to its small size. The ant can rapidly infest large buildings and, unlike the black ant, Pharaoh's Ant colonies can have many queens and can split into sub colonies, covering a wide area. It can also be carried from one property to another. The most obvious signs are the trailing ant patterns sometimes resembling moving vines on the walls of a property. Generally you will need to get advice on treatments from a pest control worker, as treatments used for black ants may not work. The use of traditional insecticides can also encourage the spread of the ants as they will avoid treated areas. Good hygiene and housekeeping are essential for treatments to be effective as alternative foods will distract them from ant baits.